Thirty-nine volunteers picked up 44 bags worth of bottles, cans, and other unsightly trash along the Piscataway Creek shoreline April 14 as part of the annual Potomac River Watershed Cleanup. Piscataway Hills residents and a few environmentally minded volunteers from nearby areas enjoyed a perfect spring day for the cleanup. Among the more unusual items hauled out this year were a file cabinet, a wheelbarrow, a broken wooden bench, and two propane tanks. Only eight tires were found, which was far fewer than in previous years. 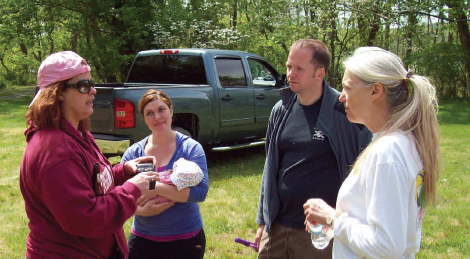 “Everyone agrees that there was far less trash this year—we must be making a difference,” said Debbie Kutzleb, who organized the Piscataway Hills shoreline cleanup along with PHCA Vice President Dave Lishin. The Piscataway Hills cleanup crew picked up trash ￼from Lot 39 Waterfront Park and the adjacent National Park Service land. Crews in boats also cleaned up the island across from the Lot 39 boat ramp and upstream along Piscataway Creek to the Indian Head Highway Bridge. All the trash was taken to a special dumpster at Fort Washington Marina to be hauled away. Doughnuts and cookies gave the volunteers an energy boost before they started work at 9 a.m., and they were rewarded with hot dogs, beer, and other cold drinks after the cleanup ended around noon. 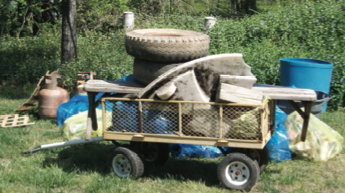 Piscataway Hills was one of 392 registered sites in this year’s Potomac Cleanup, which is sponsored by the Alice Ferguson Foundation. Altogether, 7,532 vol- unteers picked up 118 tons of trash, including 1,178 tires, 126,500 recyclable beverage containers, 25,571 plastic bags, and 24,616 cigarette butts. Since our previous newsletter last fall, we have been very busy in the Hills. In February 2012, I attended County Executive Rushern Baker’s Public Budget Hearing at Harmony Hall and spoke on behalf of PHCA to the panel on the benefits of restoring the leaf vacuum program. We’ve held two quarterly association meeting already this year, and discussed a plethora of topics including, but not limited to, security measures within the neighborhood, and Neighborhood Watch; the opening of the Tucker Road Sport & Learning Complex and the National Harbor Tanger Outlet; and upcoming volunteer opportunities within the neighborhood. As I mentioned in my last column, my focus is getting more input from the community on what issues are important and of interest to you, and you responded loud and clear!! The hottest topic at our last quarterly meeting was the construction of a community playground at the Waterfront Park. Although our community is uniquely different from other traditional neighborhoods, and we haven’t had a lot of small children in the neighborhood for many years, we should still offer standard amenities available in all other neighborhoods, and that includes a nearby playground for our families to utilize without driving out of Piscataway Hills. A committee of families in the neighborhood has been formed to create a design of the playground for board approval, and it will be voted on during our next quarterly meeting (June 26). Please contact Maureen Bartee if you are interest- ed in participating in the design and fundraising efforts for the waterfront playground. Speaking of our waterfront park, and as we move into warmer months for water activities, we would ask that anyone who has a kayak or canoe stored at the waterfront park kayak rack and hasn’t used their boat for the last couple of summers, please consider storing your boat at home to free up rack spots for others in the neighborhood that kayak and/or canoe more frequently. We will also be discussing at our next meeting the possibility of building additional kayak/ canoe racks to accommodate increased water activities and population in the neighborhood. With so many outdoor activities to do, I look forward to seeing each and every one of you at upcoming events, out on the water, or just walking through the neighborhood. If I don’t see you between now and the end of the summer, here’s wishing each of you and your family happy travels during summer vacation and safe Memorial Day and Fourth of July holidays. Plans for a Piscataway Hills neighborhood watch, a possible security camera, and a proposal for a playground at Lot 39 Waterfront Park sparked lively discussions at the PHCA spring quarterly meeting on March 27. PHCA Board Member Neil Ayers, who is organizing the neigh- borhood watch, told the meeting that no serious crimes had occurred within the past 90 days but that rims had been stolen from four or five cars in one night. He described several situations in which he had seen suspicious activity in the neighbor- hood and called the police, who responded quickly and in one case apprehended thieves who were stealing snow shovels. Ayers called for volunteers and block captains to help organize the neighborhood watch. It had not yet been determined how detailed or formal the program would be, he said. Another possible deterrent to crime could be a surveillance camera near the entrance to Piscataway Hills, Ayers said. Because there is only one way in and out of the neighborhood, a camera could potentially record all vehicles involved in crimes, he noted. By a show of hands, participants at the meeting strongly supported further investigation of the idea, including its potential cost. Several parents of young children proposed that a playground be constructed at Lot 39 Waterfront Park. The cost is now estimated at between $3,000 and $4,000. Some participants at the meeting raised concerns about accident liability, and further investigation was recommended. A playground proposal might be prepared for a vote at the next quarterly meeting.